The application for seabed mining in Taranaki has proved controversial. The group fighting plans to mine millions of tonnes of sand off the South Taranaki coast is claiming record numbers of people have backed its campaign. Monday was the final day for public submissions on Trans Tasman Resources’ bid to mine iron ore from 50 million tonnes of sand in a 66 square kilometre area off the coast of Patea, a move all eight Taranaki iwi have opposed. 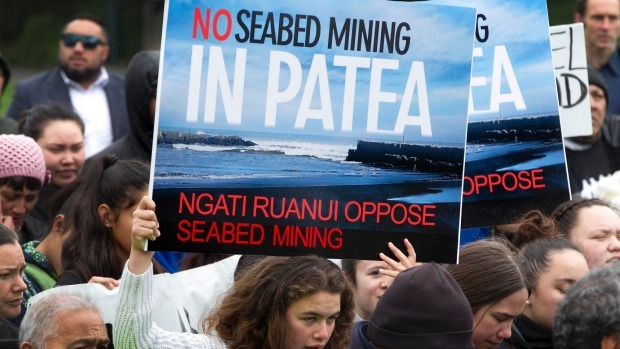 Campaign group Kiwis Against Seabed Mining claimed it and Greenpeace would achieve a record 17,000 submissions against the plans when the 5pm deadline passed, ahead of an Environmental Protection Agency hearing set to take place next year. “Last time Trans Tasman Resources tried – and failed – to gain approval for a similar proposal, the EPA received more than 4,600 submissions against it – which was a record at that time,” said KASM chairperson Phil McCabe. “We have blown that record out of the water, proving that opposition to seabed mining has grown exponentially. “Our focus now turns to the expert evidence against this proposal, and the hearing itself. “We cannot let this proposal go ahead, as it would create a precedent for other mining proposals, not only on the North Island’s West Coast, but also a proposal off Waihi Beach. TTR has claimed allowing the mining to go ahead would create 1666 jobs, including 299 in South Taranaki and Whanganui and 700 in the region, although opponents dispute its figures. The sea bed mining is inevitable and will go on through out the world at some time . It has all got to do with money and not what should be , Who really cares about the environment ,? For sure not the rich or anybody that wants to become rich from destroying our earth . Please go ahead and bring the end closer . Death wish here? Instead, support local First Peoples who try to save their worlds. Join Amnesty, Greenpeace, the Greens, Avaaz, GetUp- don’t just lie down and give up, letting rich foreigners satisfy their greed – that is lazy and helps no one. Exactly Martin. We cannot eat money. It is only the greedy who destroy the environment. The thing is how do we stop them?